Relax in Oceanfront Luxury at the 2019 TMSA Logistics Marketing & Sales Conference. 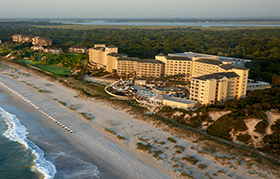 Omni Amelia Island Plantation Resort is nestled on 1,350 acres at the tip of a barrier island just off the Northeast Florida coast (just north of Jacksonville). Enjoy luxurious oceanfront accommodations, world-class resort pools, championship golf, full-service spa, endless dining options, and family-friendly activities. Unparalleled views of the Atlantic Ocean and spacious accommodations are available in all 400+ rooms. Relax on the largest multi-tiered pool deck in northeast Florida, featuring an adults-only infinity edge pool, a 10,000-square-foot family-friendly pool, Splash Park water playground for the kids, two hot tubs, and over-sized fire pits. Stroll 3.5 miles of pristine beach or spend an afternoon kayaking and paddle-boarding through Amelia Island’s preserved marshlands. Children will enjoy our award-winning kids’ camp and Nature Center, both of which offer supervised activities. TMSA has negotiated a discounted rate of only $209 for Oceanfront Run of House Sandcastle Villa or Corner Suites! (Make your reservations no later than May 9, 2019 - rooms and discounted rate cannot be guaranteed after this date). IMPORTANT NOTE: Hotel Scam Alert! If you receive inquiries from a third party to book hotel reservations, please be aware, TMSA has not given permission to block, reserve, or book hotel reservations on their behalf. In addition, TMSA has no recourse for reservations made through a third party. These inquiries are misleading solicitations to TMSA’s attendees and exhibitors, which are not authorized by TMSA. Check-in time is 4pm and Check-out time is 11am. All guests arriving before 4pm will be accommodated as rooms become available. Guest Service staff can arrange to check baggage for those arriving early when rooms are unavailable and for guests attending TMSA conference functions on departure day. All reservations must be guaranteed by a valid major credit card, which will be supplied at the time of reservation. One night deposit for the Omni Resort is due at time of booking and if a guest must cancel they must do so prior to 12pm seven days prior to arrival to avoid forfeiture of the deposit. The dress code is at least business casual attire for all conference activities, Speakers, exhibitors and sponsors are encourage to wear business attire as appropriate. If you are attending the Sunday Welcome Reception, make sure to wear attire (either casual or more dressed up) to celebrate this special theme. If you are attending the Compass Awards Banquet Monday evening, formal or professional business attire is appropriate. If you're taking advantage of any Amelia Island Adventure activities, dress appropriate for them.